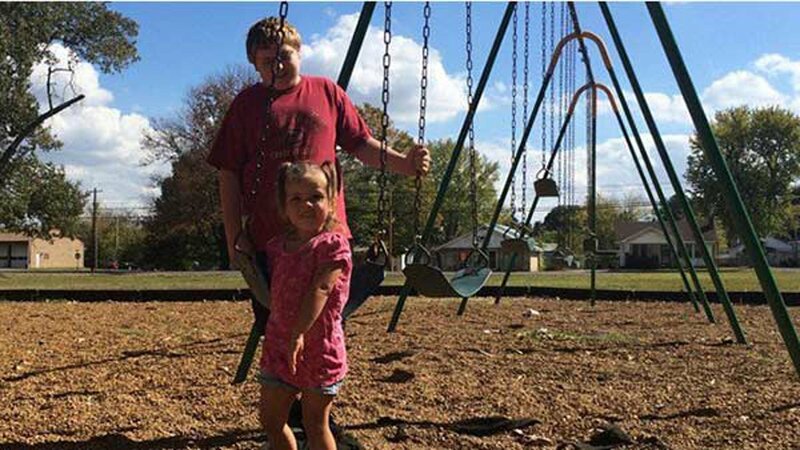 TULLAHOMA, Tenn. -- Parents in the Tullahoma area are concerned that an attempted kidnapper is on the run. WSMV reports that police are thanking a 14-year-old boy for stopping the attack. Saturday afternoon, 3-year-old Isobel Conant was playing with her aunt and cousins at the South Jackson Civic Center in Tullahoma when a stranger snatched her up and ran away. The toddler's 14-year-old cousin, Jerry Roberts, was just feet away on the playground when he saw the man drive up. "I was standing on the slide and a white van pulled up and a man got out," Jerry said. He said the man, who was dressed in all black, sat on a tree stump and stared at the little girl. "From what he was wearing, I thought I better watch this guy. He might try to do something," Jerry said. But when the teen turned around to look for his younger brother, he said the stranger grabbed Isobel and ran off. Jerry leaped over and tackled the man to the ground and a fight ensued. "He kicked me off of him, but so I started tackling him again. He started kicking me and hitting me but I kept tackling him," Jerry said. His aunt said he has bruises on his chest from fighting with the attempted kidnapper. "I didn't really have time to be scared because I just wanted to save my baby cousin Isobel," the teen said. The man dropped Isobel to the ground. She suffered minor bruises. Police are now looking for the would-be child abductor. "He was white. He had a black hoodie on that zipped completely up over the face, a hat, he has a short haircut. He was wearing neon yellow Nikes and blue jeans with a white T-shirt," the teen recalled. Tullahoma police said the man also had on Harley-Davidson sunglasses and gloves to further conceal his identity. He was driving a white worker van with no rear windows and a distinct Iron Man sticker on the back. "We think that's pretty significant that somebody's probably seen a van like that especially with a decal of that nature," said Tullahoma Police Chief Paul Blackwell. Blackwell said he hasn't seen an abduction attempt like this since he has been sheriff in the city of approximately 20,000 people. Blackwell said investigating officers have gone to other parks populated with children. Some parents have said they've seen the suspicious man who appears to be in his 20s. "The key to this is someone recognizing that van and giving us some information so we can start to do some follow up to this," Blackwell said. "We've gotten many contacts, phone calls, Facebook posts that have said I've seen that vehicle before and seeing him acting suspicious." Monday, the girl's mother, Desiree Conant, hugged and kissed Isobel. "He grabbed her off of the swings," Conant said. "It's been my nightmare since the day she was born." Thankful to her nephew, Conant followed them both around the playground on Monday afternoon. "I love you. You're mama's world," she told the little girl as she picked her up. "I love you too," Isobel replied, kissing her mother on the cheek. "Keep your eyes out for his van. Keep your eyes out," Conant said, in a plea to the Tullahoma community. "Help us find him, catch him." Anyone with information on the alleged crime is asked to call Tullahoma police at (931) 455-0530.